The topic of today’s live session in the Trading Room was Trailing Stops and Multiple Lots. The topic generated some excellent questions and prompted this Post of the Day. Before we get into the trading of multiple lots, here is a cautionary note. Remember that each time a trader opens an additional lot, they take on more risk. For example, if a trader opens one position with a 100 pip stop, they are taking on 100 pips of risk. If they open three positions, they are taking on 300 pips of risk! Be certain that your account size can handle the risk that you are taking on. 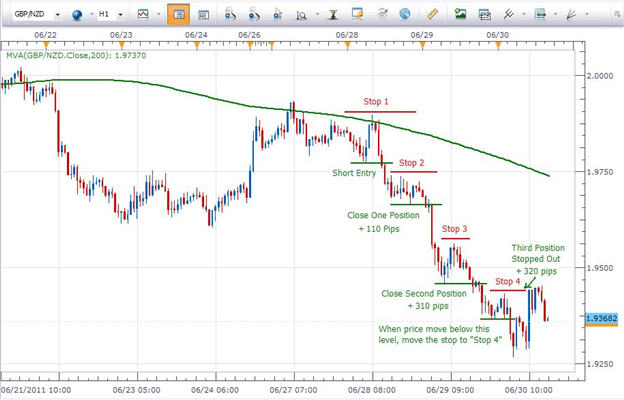 On the chart below we can see the basics of how each of these strategies could have been put into action based on the recent movements of the GBPNZD currency pair on this 1 hour chart. We would enter the trade with three 10K positions at the point labeled “Short Entry”. Price has broken through support triggering our entry and the stop would be placed at “Stop 1” level. As price continues to move in our favor and breaks below the second green support level, we would close one of our three positions and move the stop to the “Stop 2” level. By doing so we have locked in roughly 110 pips of profit and placed our stop above a new resistance level so that our two open positions are protected. Since our stop is now below our entry at this point, if the pair retraced and hit our stop we would show a small profit on the remaining two positions plus the 110 pips we gained by closing the first position. Since price continues to move in our favor, when it moves below our next green support level we would close out one more position for a gain of about 310 pips on that one and move our stop to “Stop 3”. As was the case above, we have locked in more profit and, by trailing our stop to the next level of resistance, we are protecting our “floating profit” on the remaining third position which is still open. On this last open position we will simply trail the stop as long as price action moves in our favor and let ourselves be stopped out at some point as the pair retraces. So, as price moves through the next green support level we would advance the stop to “Stop 4”. We can see that price did not continue to move lower and, as price retraced, we were stopped out at the Stop 4 level. Since that position had been open since the beginning of our trade, we were stopped out for a gain of +320 pips on the last 10K lot. Overall, the gain on the three lots was 740 pips. Had a single lot been placed on the trade the gain would have been 320 pips. Certainly admirable, but not 740 pips. From this example the potential benefits of manually trailing one’s stop and trading multiple lots are quite apparent. Richard Krivo contributes to the Instructor Trading Tips articles. To receive more timely notifications on his reports, email rkrivo@fxcm.com to be added to the distribution list.